Northern Ireland's Danielle Hill set a new senior record on day three of the Irish Open Swimming Championships. Hill beat her own previous best to win the 50m backstroke title as Brendan Hyland also set a new national record on his way to the 200m butterfly gold. Larne swimmer Hill, who won the 50m freestyle on Thursday, continued her return from injury as she beat her 2017 mark to finish in 28.64 seconds. Lisburn's Daniel Wiffen won the 800m freestyle in a new junior record time. Hyland produced a superb swim to take the 200m butterfly title for the eighth consecutive year and his time of 1:57.21 shaved 0.17 off his previous best over the distance. Wiffen, 17, stormed to victory in the opening race in Dublin and his winning time of 8:16.79 was almost two seconds faster than the previous Irish junior record and also met the consideration times for both the European and World Junior Championships later this year. Calum Bain of Cookstown set a new championship record of 22.58 in the 50m freestyle final to add to the 50m butterfly title he won on Wednesday. Hill also took bronze behind Erin Riordan in the 100m freestyle final while Scotland's two-time Olympian Hanna Miley took her third gold medal of the week as she won the 200m butterfly in 2:13.39 with Dubliner Ellen Walsh finishing second to take the national title. In the final race on Friday, Limerick-based swimmer Cadan McCarthy retained his 400m individual medley title ahead of Alfie Kelly and Eoin Corby. 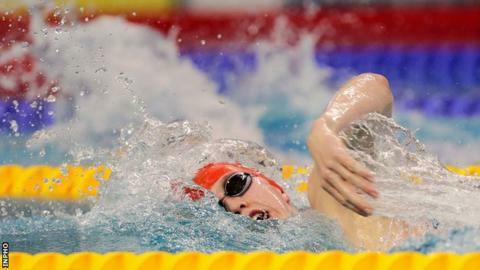 On Thursday, Northern Ireland teenager Conor Ferguson took the gold in the men's 50m backstroke. The former European junior silver medallist clocked a time of 25.32 seconds to finish ahead of his National Centre Dublin team-mate Rory McEvoy.